Early intervention means identifying and providing effective early support to children and young people who are at risk of poor outcomes. Effective early intervention works to prevent problems occurring, or to tackle them head-on when they do, before problems get worse. It also helps to foster a whole set of personal strengths and skills that prepare a child for adult life. Early intervention can take different forms, from home visiting programmes to support vulnerable parents, to school-based programmes to improve children’s social and emotional skills, to mentoring schemes for young people who are vulnerable to involvement in crime. While some have argued that early intervention may have its strongest impact when offered during the first few years of life, the best evidence shows that effective interventions can improve children’s life chances at any point during childhood and adolescence. Early intervention works to reduce the risk factors and increase the protective factors in a child’s life. We have a good understanding of the risk factors that can threaten children’s development, limit future social and economic opportunities, and increase the likelihood of mental and physical health problems, criminal involvement, substance misuse, or exploitation or abuse in later life. These factors exist at different levels within the child’s environment – at the individual, family, community and society level – and interact in complex ways. 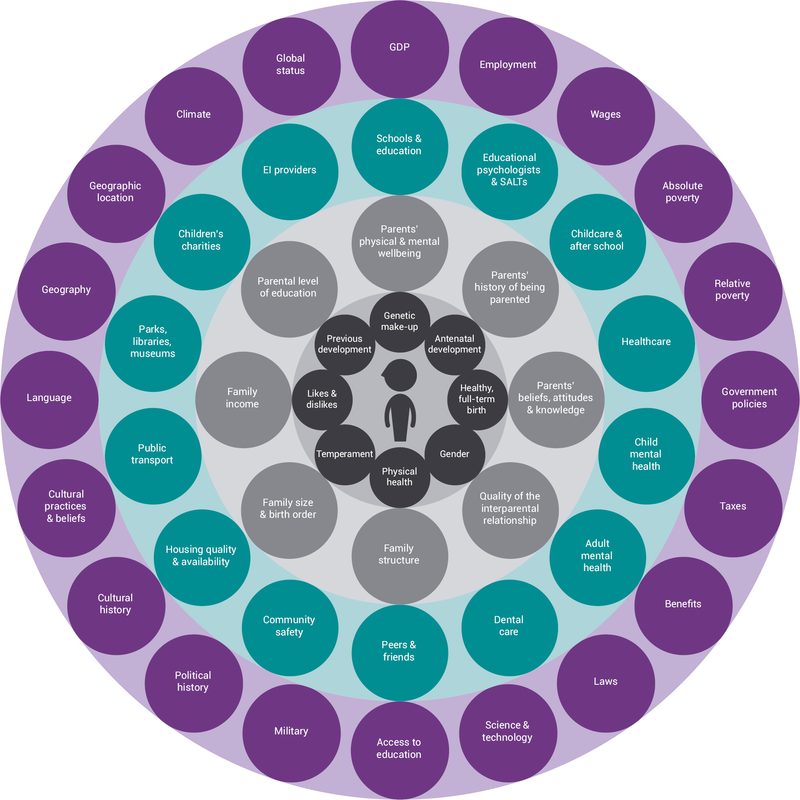 Protective factors are the characteristics or conditions of individuals, families, communities and society that can mitigate these risks and increase the health and wellbeing of children and families. In many cases, risk and protective factors are two sides of the same coin: for example, poor parental mental health may pose a risk to a child’s healthy development, while good parental mental health may provide a protective factor against other negative outcomes, such as behavioural problems or poor academic attainment. These risk factors are not deterministic or predictive at an individual level: they cannot tell us exactly which child or young person will need help. But they can help us to identify children who are vulnerable and who may need extra support. Studies show that early intervention works best when it is made available to children on the basis of pre-identified risks. Many families need more support than is available through universal services, such as schools and GPs. Early intervention works best when it targets particular families or individuals, on a selective or indicated basis. Targeted selective interventions are offered to families on the basis of broad demographic risks, such as low family income, single parenthood, adolescent parenthood or ethnic minority status. Although children growing up in these circumstances may not be suffering any specific problems, interventions that select families on the basis of these kinds of risks have the potential to keep more serious problems from occurring. Targeted indicated interventions are offered to families who have been identified as having a specific or diagnosed problem requiring more intensive support. In these cases, early intervention can no longer prevent problems from occurring, but has the potential to help in treating the problems and minimising or reversing long-term impacts on a child’s development. As early intervention moves up the scale from universal to targeted selective to targeted indicated, interventions become more intensive, and are offered to a smaller group of families. What can early intervention achieve? Early intervention approaches often focus on supporting four key aspects of child development – their physical, cognitive, behavioural, and social and emotional development – where it has the potential to make the biggest difference and provide benefits throughout a person’s life. Physical development involves children’s physical health, maturation and the presence or absence of a physical disability, and it provides the basis for positive development in all other areas. Physical outcomes targeted by early intervention activities include improving birth outcomes, reducing the incidence of infectious diseases and decreasing childhood obesity. Cognitive development includes children’s acquisition of speech and language skills, their ability to read and write, their numeracy capabilities and their understanding of logical problem-solving. Positive cognitive development is strongly associated with a child’s success in school and entry into the workforce. Cognitive outcomes typically targeted by early intervention include performance on standardised tests, school achievement, and higher education and employment opportunities once they leave school. Behavioural development involves children’s ability to monitor and regulate their own behaviour, attention and impulses. Children’s self-regulatory skills are highly associated with their ability to form positive relationships with others, as well as their success in school. Behavioural self-regulation difficulties during childhood are highly predictive of children’s involvement in criminal activity during the teenage years and adulthood. Behavioural outcomes frequently targeted by early intervention include reducing antisocial behaviour and crime, violence and aggression at school, and affiliation with antisocial peers. Social and emotional development involves children’s awareness of their own emotional needs and the emotional needs of others. Social and emotional development also encompasses the development of children’s self-esteem and their ability to manage negative feelings. Social and emotional development is strongly associated with a child’s ability to form positive relationships with others and a reduced risk of depression and other mental health outcomes. Early intervention outcomes associated with children’s social and emotional development include increasing pro-social behaviour, improving self-esteem and reducing the incidence of clinically diagnosed mental health problems. Early intervention also targets three key additional ‘threats’ to a child’s development which are strongly associated with adverse outcomes during adolescence and adulthood: child maltreatment, substance misuse and risky sexual behaviour.